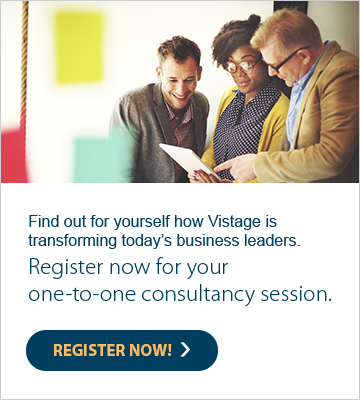 The name Vistage is a combination of ‘Vista’ (a view of the world) and ‘Advantage’. Being a part of the Vistage community certainly gives you an advantage over others and a unique and privileged view of the world. Best of all, you could join a world-class team who provide executive and leadership training to business leaders across the country. Vistage is an amazing place to learn; more than you’ve ever done before. You’ll work with some incredibly talented people within our Member, Chair, Speaker and Staff community. You’ll see people go through a powerful and life-changing journey and play a part in making it happen. We’re serious about what we do, but we don’t take ourselves too seriously. Yes we work hard, but we also like to have fun. We’re very informal and we work fast. If you love working on new things; you’re passionate and take a pride in what you do then Vistage might be for you. We’re always looking for great talent so feel free to get in touch and tell us who you are and WHY you would want to be part of our executive coaching team. Are you a successful CEO, Managing Director, senior Executive, Entrepreneur or Executive Coach looking for a change in career, perhaps mixing non-exec work with executive mentoring and coaching? Are you looking for an annuity-style regular income in a community where you work with business owners and senior executives and learn from world-class business experts?